You have already taken the first step, simply by visiting our website. The next step is to contact our office, so that a flight school representative can answer any questions that you might have. We will be happy to arrange an introductory flight lesson for you just tell us what time is convenient for you! For your introductory flight lesson, we will schedule an hour and a half with one of our airplanes and one of our Certified Flight Instructors. You have several options for the type of aircraft, including a Diamond DA20, a Cessna 152, a Cessna 162 or a Cessna 172. You can visit our rentals page for descriptions and rates for these aircraft to help you with your selection, or ask a flight school representative for a recommendation. When you arrive at the airport, your instructor will begin by showing you our facilities and answering any questions that you might have. After a brief familiarization with the aircraft and its components, you will be off! 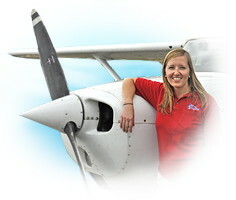 Actual flight time is generally around 40 minutes; you will have control of the airplane for the majority of the time. To learn about getting a Private Pilot Certificate, please visit our Instructional Services page, or view our Frequently Asked Questions. If you have questions that are not answered in either of those areas, please contact our office for additional information.